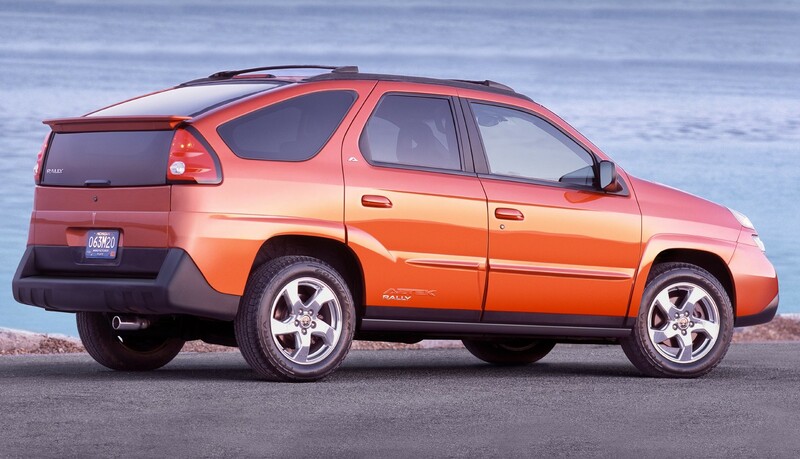 The Pontiac Aztek!… Wait, what? Clearly Mitsubishi did not realize that Pontiac Aztec is frequently Googled because it’s considered one of the ugliest cars of all time, because its new Eclipse Cross bares more than a passing resemblance to the famous GM disaster-on-wheels. Okay, so the Cross is not nearly as willfully ugly as the Aztek, but you got to wonder who at Mitsubishi thought that splitting up the rear tailgate with a fake spoiler, Aztek-style, was a good way to give their car a look that customer would hunker for? Sure, the controversially-styled Nissan Juke was a huge success when it first came out, but ever since then it’s been well-and-truly outmaneuvered and outsold in the US and Europe by more conventionally-styled cars. Mitsubishi may turn heads with its, ahem, bold new rear, but I don’t think it’ll open nearly as many wallets as the carmaker needs it to. Yeah, totally agree, it 100% (from the rear) looks like the Pontiac Aztek. Sadly for Mitsubishi that really isn’t a good thing, the Aztek not being the prettiest car ever designed!! Poor Mitsubishi! I can’t agree. At 1st sight something like Honda’s Suvs. For me it looks like, using words from article- ” me too” another SUV. What the Eclipse Cross shows is the way Japanese brands not only try to copy foreign brands (Honda looks at Volvo, e.g. CR-V), but also look at each other. I do this Mitsubishi eclipse cross because it show how great it is. I will support this Mitsubishi eclipse cross. Haha, the resemblance is uncanny! Serves them right for tarnishing the Eclipse name. I would say that Mistubishi lost its identity for long time..unfortunately even some nice car like Colt (2002-2012) after redesign become…ugly. I hope that Renault will manage to do something with their design team…. Honda and Toyota have designed some of the most weird small SUVs. Even the Chinese can make more harmonious designs.